News reporter Henry Taggart (Heflin) goes to Little Delft, Michigan to cover the Tulip Festival. While there, he stays at the quaint House of the Seven Tulips inn, run by Mr. Van Maaster (Sakall). Maaster’s seven daughters-all who have boy names-help run the inn. Spoiled Regina (Hunt) tries to woo Henry but he falls for Billie (Grayson). The only problem is old-fashioned Mr. Maaster won’t let his younger daughters marry before Regina marries. -This film is a family affair: Kathryn Grayson’s brother Michael Butler and sister Frances Raeburn are in the film. Grayson had a larger career than her siblings. -Ann Rutherford was originally supposed to be in the film but she had measles. She was replaced by Peggy Moran. -A film adaptation of a Hungarian play called “Seven Sisters.” The film appeared on Broadway in 1911. -Producer Joe Pasternak’s first film at MGM. -Van Heflin attempting to dance a traditional dance during the Tulip Festival. This song is fun and adorable. 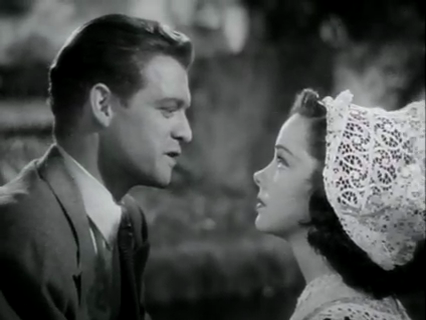 Though she’s a brat, Marsha Hunt looks adorable, and I swoon every time Van Heflin smiles. This is only Kathryn Grayson’s fourth film, so you get to see her as she is still blossoming into stardom MGM. 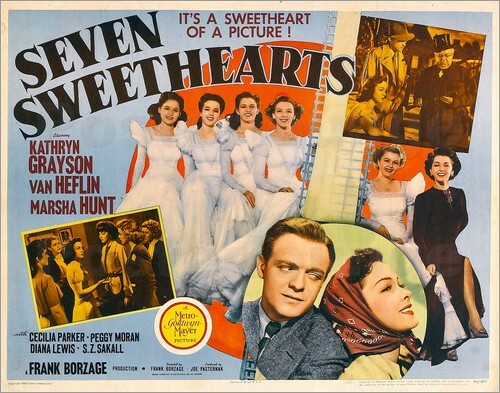 “Seven Sweethearts” isn’t one of MGM’s huge, glittering musicals, and usually goes under the radar. However, it’s adorable and a lot of fun. This entry was posted in Musical Monday and tagged 1940s musical, Kathryn Grayson, Marsha Hunt, Musical Monday, Seven Sweethearts, Van Heflin by Jnpickens. Bookmark the permalink. I actually haven’t heard of this film, but it sounds quite sweet. It seems odd for Van Heflin to be cast in musicals, but he also had co-starred with Judy Garland in “Presenting Lily Mars,” so he did have some experience with them.